Well we made it to February. Yeah! January is always so hard for me to get through. The holidays are over and nothing exciting is going on except to watch the snow fall so I am always glad to see January go. Valentine's Day is still a few days away so there is still time to make a little something for your table. 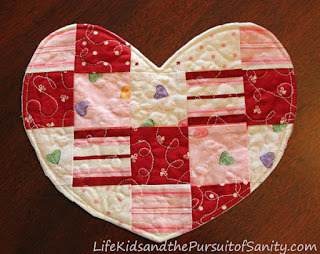 I was thinking that maybe you guys would like to make a quick mug rug that doesn't take much time and looks pretty simple so I went on the hunt for a tutorial and found this little heart mug rug tutorial for you from Life, Kids And The Pursuit Of Sanity Blog. This mug rug looks pretty simple and of course......quick. :) I think I will add this to my list of "try some day list". LOL!